FRANKIE HEARTS FASHION: 3.1 + Announcement! Ridiculously smitten with my new 3.1 Philip Lim booties that I scored on major sale at La Garconne! I'm a true 36 but I still get a little leery when ordering shoes that are final sale...especially having never tried on the brand before. 9 times out of 10 I have great luck and leave it to beaver I lucked out once again! This is the kind of gambling I like to engage in...shoe gambling. So comfy and the perfect fall transitional boot...I have a good feeling that this is the beginning of a sweet love affair with my main man Philip. On to more exciting news! I've been working for the past couple of months on a new and exciting venture and I'm so excited to finally announce it! Visit our homepage and subscribe to find out the official launch date and to receive exclusive offers! P.S. Do yourself a favor and familiarize yourself with the uber talented Danielle Moss...the girl has serious skilllz. holy sh*t nicole. i think this may be my most favorite outfit you've ever worn!!! the white w/ blk trim jacket.. the ruffled green chiffon top.. and those booties.. the back heel is effin' amazeballs. that is all. hahahaha. i love ur jacket!!! and those heels are amazing! Those shoes are amazing! I love your whole outfit and the colour of the top! So lovely. How incredible are those boots?! And on sale, too. Your blazer is lovely as well. The boots are amazing and well worth the risk!! I love the whole outfit, too and pairing the black and white with the teal-ish top is such a good idea! Congrats on the new venture, too, good for you! This outfit is killer! Those boots are fricken awesome, what a great gamble. Good luck with the shop, how exciting! Congrats on the boots and the shop! Can't wait to see more. I have a little 3.1 treat arriving at my door today. So cannot wait! LOVE those boots, and great outfit!!! So excited for you!!! Congrats on your new shop! Gorgeous outfit! Such a chic and beautiful combo. The jacket is my favourite - I've been looking for something similar, almost close enough to the Chanel tweed jacket but no luck. Love the tiered green top + chain necklace as well. beautiful shoes, so glad they fit!! Love the green top, love the blazer...you look gorgeous! Excited to check out your shop...happy weekend! Congrats on your venture! You always look amazing! I'm off to check out the shop - congrats, that's really fantastic! Those booties are killer love!! OMG yay for your shop! Cannot wait! Congrats on your store. Good for you. Eep, lady that is SO EXCITING! So proud of you & happy for you! Cannot wait to see what you have up your sleeve! Also, you look super gorg here! I love that you're into shoe gambling! Haha! Definitely paid off here, these are hot! I will only gamble on shoes that don't need to fit perfectly... like, boots or booties. Shoes that don't have much room for error (most pumps) I can't risk, as I go back & forth between 7.5 & 8 allll the time. Happy weekend! xo! Oh, those booties are so gorgeous and You have styled up all your look so effotless chic. Love that jacket. Now I'm off to check your shop. Congrats on the new shop! I am totally looking forward to checking it out! I loooove these booties! So ridiculously excited for shop frankie! These boots are gorgeous! They make the whole outfit! wooow nicole shoes are just GREAT! Are your booties really that comfortable? They usually aren't! These you can pair with almost anything! 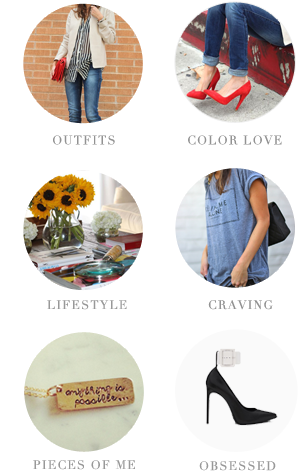 Following you on Bloglovin, I would love it if you followed me back! Those shoes are awesome! I'm new to your blog and I love it, can't wait to see more! Already familiar with Danielle's work, she's FAB!! SO is this outfit lady, you look great - love green on you and this jacket is fab. THOSE BOOTS. OMG. there are no words. Subscribed to the newsletter, can't wait to hear more!! so excited for you! Dying over these shoes - they are amazing! And congrats on the shop! Super exciting! This outfit is elegant beautiful. Love the boot with it. 1. Those booties...WOW. 2. I'm soooooo intrigued! 3. I totes subscribed! Congratulations on your new shop! Fantastic outfit. I love everything about it. those boots are gorgeous! majorly jealous!! Shoe gambling is the only type of gambling I do too. Looks like it was well worth the gamble, those are incredible! Enjoy them! Congrats again on the venture! And awesome with nailing it with the shoes. I always hate ordering shoes because of the same reasons.